For more than a year, Thembi carried a tape recorder and kept an audio diary of her struggle to live with AIDS. Her story aired on National Public Radio in the U.S., and in the U.K., Australia and Canada, reaching more than 50 million people. Thembi traveled to the United States in 2006 to present her story. In March 2007, Thembi's AIDS Diary was heard in South Africa for the first time - in English, Xhosa and Zulu. Thembi and Radio Diaries toured South Africa, presenting her story at high schools, universities, community clinics, Constitution Hill, and Parliament. You can read about the tour and see photos on Thembi's Blog. Thembi was a youth ambassador for Nelson Mandela's 46664 concert and campaign against HIV/AIDS in South Africa on World Aids Day, Dec. 1st, 2007. Read about it on her blog. Thembi travelled to Germany in June 2007 and India in October 2007 as a UNICEF ambassador. Thembi's AIDS Diary has won the Overseas Press Club Award for best international radio story of 2006. We now have CDs of Thembi's AIDS Diary. The CD includes the English, Xhosa, and Zulu versions, and is introduced by Desmond Tutu. Thembi, Melikhaya and their daughter, Onwabo, have been living with family members in different shacks in their township, Khayelitsha. Thanks to your donations and support, we raised $8,000 for Thembi and her family to buy their own brick home. Thembi, Melikhaya, Onwabo and the Radio Diaries team thank you. We have launched the Radio Diaries podcast! Subscribe for free and get our stories downloaded directly to your iPod and MP3 player. Find out how to subscribe. 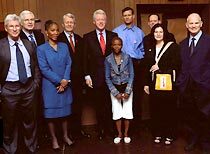 In April 2006 Thembi was part of an internationally broadcast CNN special that included former President Bill Clinton, Paul Farmer of Partners in Health, the heads of Pfizer, Worldvision, CARE, Doctors Without Borders, and actor Richard Gere. DONATE and help support future Radio Diaries projects. 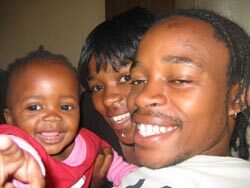 If you prefer to donate directly to Thembi and her family please contact us for details. by Thembi's boyfriend, Melikhaya Mpumela.